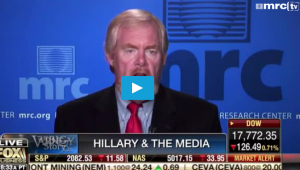 “When you see MSNBC attacking [Hillary Clinton] from the left, you realize, I think, just how far MSNBC has gone,” Media Research Center president and founder Brent Bozell quipped on today’s edition of Fox Business Network’s Varney & Co., responding to host Stuart Varney’s observation that the former Secretary of State is beginning to see some tough treatment in the media, albeit perhaps more often from her left, particularly given her left-wing challengers in the primary. The bigger issue is this: How in the world are the media just taking it in the jaw as Hillary Clinton refuses to talk to them. You know, I cannot believe that if a Republican refused to talk to the press the press would just take this lying down. But they’re taking it lying down.